By Chris Williams: Nonito Donaire (27-1, 18 KO’s) steps up in weight this Saturday night to try and add a third world title to his collection in a fight against Wilfredo Vazquez Jr. (21-1-1, 18 KO’s) for the vacant World Boxing Organization (WBO) super bantamweight title at the Alamodome in San Antonio, Texas. Donaire, 5’7”, needs this win against the 5’5” Vazquez Jr. to move on to bigger fights against Jorge Arce, Juan Manuel Lopez and Yuriorkis Gamboa. Donaire is seen as someone on the cusp of stardom but he needs some quality wins on his resume that boxing fans really care about. In hindsight, the Vazquez Jr. fight was pretty much a waste of time for Donaire, as boxing fans see it as a mismatch due to Vazquez Jr. recently being knocked out by Arce. Collecting a title just for the sake of collecting a title is a waste of Donaire’s career, because he’s roughly devoted quarter of a year on this fight and it’s hardly worth it. Donaire will be Vazquez Jr. but will be no better off than he was before he fought him other than the money he makes for the fight, which pales in comparison to the kind of money he can make against better fighters like Lopez and Gamboa. Arum needs to skip past these lesser fights and go straight into the bouts that count while they’re still there for him and while he’s young enough to compete. Lopez could get beaten again by Orlando Salido, and there won’t be any point in a Lopez-Donaire fight after that. 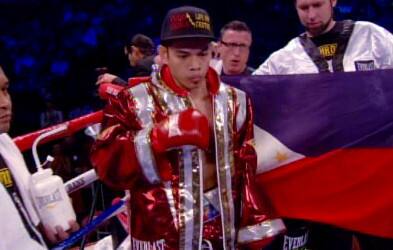 Arum seems to be moving Donaire too slowly. He doesn’t need to be going after paper straps against guys that were just knocked out like Vazquez Jr.
There’s no value add for that kind fight other than picking up an easy title so that the HBO announcers can list Donaire as a three division world champion. It’s not as if Donaire is earning it against the best fighter in the super bantamweight division and that kind of taints it. Put Donaire in with WBA super bantamweight champion Guillermo Rigondeaux and then he’s got a opportunity to win a belt that actually matters instead of a paper strap against the recently knocked out Vazquez Jr., who’s already having problems making weight for the fight. Rigondeaux would probably beat Donaire and that’s the likely reason why Donaire is being matched against Vazquez Jr. instead of the much more dangerous Rigondeaux.